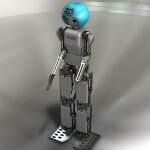 Middle size (TEEN size) humanoid robot | Hajime Research Institute, Ltd.
Middle size humanoid robot can afford to the size and weight that can be mounted equipment such as a small PC and cameras.The weight of the robot is about 10 [kg] and light, so that it is relatively easy to operate and test it. The controller and system configuration is the same in all sizes of the robot, so that it is easy to migrate to small size to medium size robots. 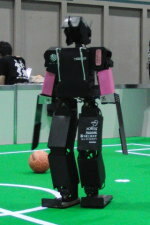 The mainstream of the middle size robot is now “HAJIME ROBOT 39”. 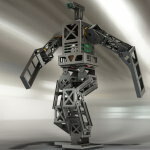 The robot has high torque servo motors made by Vstone in the legs. A parallel link mechanism in the legs is adopted to improve walking accuracy. It is possible to change the actuators from Vstone servo motors to Robotis or Futaba servo motors. 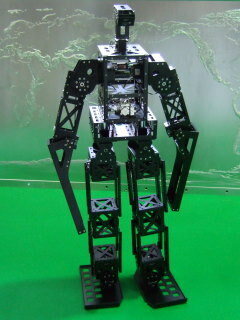 We sell a platform kit for RoboCup humanoid league Teen size. 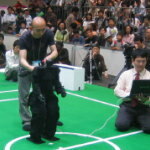 The user won at RoboCup 2010 (CIT Brains at RoboCup 2010).